When it comes to improving and correcting tooth alignment, more and more people are turning to Invisalign®. This invisible alternative to braces and traditional orthodontia is a hit with patients of all ages since it's so simple and effective. By wearing Invisalign® aligners as instructed, the teeth are gradually shifted into an ideal position. 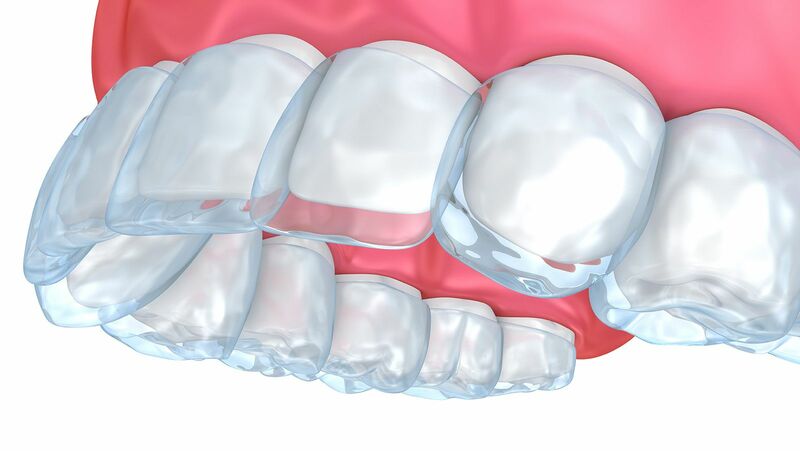 The team at our Redwood City practice would like to consider how Invisalign® is used to treat overbites. This should help you understand your many orthodontic treatment options. An overbite refers to cases in which the teeth of the upper dental arch overlap and cover the teeth of the lower dental arch. An overbite isn't necessarily bad. In fact, most people with good dental alignment have just a slight overbite to some degree. However, when the overbite is fat too pronounced, it can lead to health problems. For example, a major overbite could involve the upper teeth completely overlapping and concealing the lower teeth. This is known as a deep bite, and it can lead to a number of cosmetic and health concerns. Poor Smile Aesthetics – A deep bite simply does not look as appealing or as good as a normal bite. Major overbites can cause a person to feel self-conscious about smiling, laughing, or speaking, even around people they have known for many years. Pain While Biting and Chewing – When teeth are poorly aligned, there's a greater risk of someone experiencing paint and discomfort while they bite and chew. This can be a sign of serious wear and tear on the teeth from normal daily activities. Risk of Bruxism (Teeth Grinding) – When teeth are not properly aligned, people tend to grind their teeth. This gnashing, shifting, and clenching of the teeth can lead to tooth damage as well as serious wear on the jaw joint. Can Invisalign® Correct an Overbite? Yes. Invisalign® can be used to correct overbites and many other kinds of issues related to poor dental alignment. If a patient's deep bite is too severe, there is a chance that Invisalign® may not be the most ideal option. Good candidates for Invisalign® are people who have issues with the alignment of their teeth. Generally, these problems should be related to position and the alignment of the teeth per se rather than the shape of the dental arch/palate or the position of the jaw. Invisalign® candidates may be teens or adults. Invisalign® treatment tends to take as long as treatment with regular braces. In the case of correcting an overbite, treatment will usually be about a year, give or take. If Invisalign® isn't an ideal option for treating an overbite, traditional braces, headgear, palate expanders, and other appliances may be considered. The ideal treatment will depend on the primary cause of the overbite as well as the age and needs of the patient. To learn more about Invisalign® and whether or not it's the ideal option for you and your needs, be sure to contact our cosmetic and restorative dentistry center today. The team here at our practice will be more than happy to answer all of your questions and address your concerns.